This is a day late…Oops. On Tuesday 14th February – Valentines Day & our 8 year anniversary it was the day we got to see our baby again. The scan date couldn’t have fallen on a more perfect day for my partner and me and one to certainly remember. 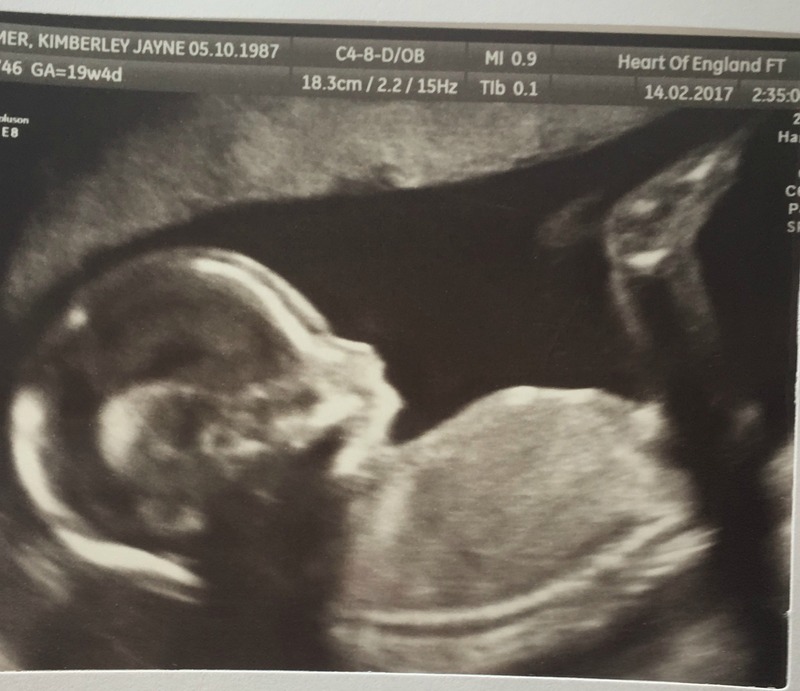 Our appointment was at 1.40pm, I left work in town at lunch time around 1 PM, and jumped on the train with excitement to see our little baby at 20 weeks – halfway through already, how has the time flown so quick? We arrived at Solihull Hospital, parked up and wandered into the women’s unit, luckily it was fairly quiet too so didn’t have to wait too long to be seen, maybe 10 minutes. We were both so excited and couldn’t wait to see our little baby. We then got called in, my heart was beating really fast but I was so nervous at the same time, I was excited and nervous all rolled into one. I lay down on the bed, the lights were turned off and the sonographer started, applied the gel and started finding the baby, she asked if she found the gender would we like to know and we both said no because we would love a surprise as it’s our first baby togther. We were in there approximately half hour because the baby was getting measured and making sure everything was developed and normal and everything could be seen. The baby wouldn’t stop wiggling nd moving away from us so the lady kept having to get me to keep moving from side to side to try to get baby to move into a better position so she could see the heartbeat and all its parts and measure him/her etc. It felt like we had been in there for ages, we were holding each other’s hands and couldn’t stop smiling and I felt quite emotional watching our baby on the screen. It was so magical. Then the lady kindly printed out our scan pictures too and this time we got 2 copies instead of one. Off back to work we then both went. I have been feeling absolutely fine still, apart from the odd day of tiredness and horrendous heartburn on and off I am quite enjoying this pregnancy. I bet I will regret saying that in a few more weeks or months. I am exactly 20 weeks pregnant and 1 day today! Half way through already!